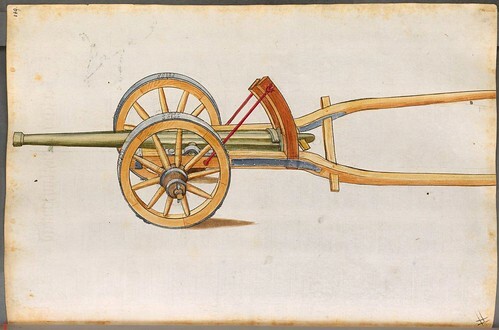 The often obscure and complex path to the development of the cannon (and associated rifles, guns and artillery) is irrevocably linked to the invention of gunpowder. The modern consensus appears to regard the mixture of saltpetre (Potassium nitrate), sulphur and charcoal - gunpowder - as having first appeared in 9th century China. Ironically, the compound was produced by alchemists in their quest for immortality, although it's likely that trial and error experimentation brought them to this stage over centuries. 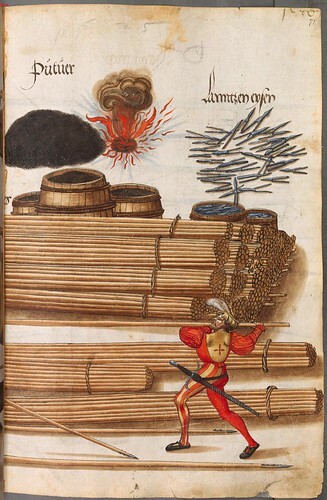 There is evidence that gunpowder was used in China in crude explosives and incendiary projectiles - such as the fire lance - for warfare in the 10th and 11th centuries, but the progression towards the modern version of the cannon was only made possible once the recipe for gunpowder had been exported along the trade routes of the Silk Road. 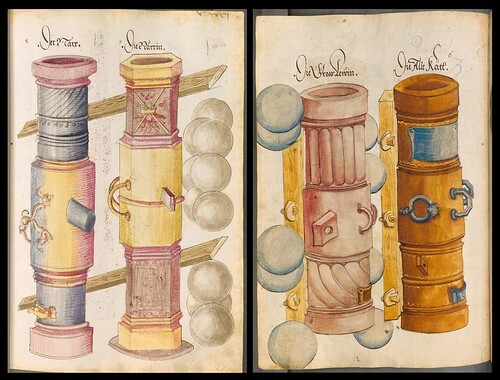 The first (foreign) written references to gunpowder appeared in Europe in the 13th century in the respective works of philosopher theologians Roger Bacon and Albertus Magnus, and in the Islamic world by way of Syrian scholar, Hassan Al-Rammah. 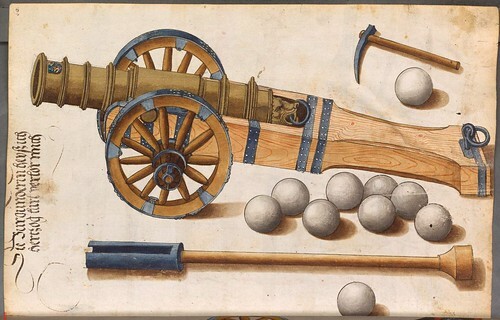 "The place and time of the invention of the cannon is unknown, but its evolution from the fire lance among the Turks, Arabs and Europeans can hardly be doubted. In 1304, Edward I made no use of cannon at Stirling, although he ordered saltpetre for Greek Fire, but by 1341 the castle was defended by the Scots with guns. Edward built what is reputed the largest trebuchet ever made, called War Wolf, for the 1304 siege of Stirling, which threw 300-pound stones. The English fortress of La Réole in Gascony fell after a month's bombardment by cannon in 1324. 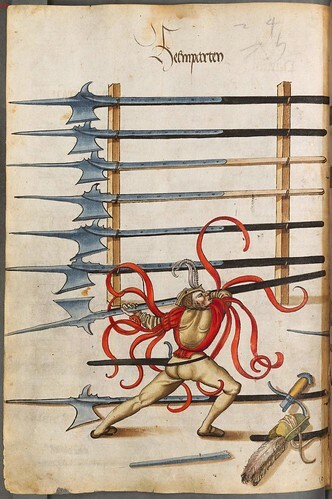 Guns are reported at Crécy in 1346, but in a minor role. The Venetians are said to have used cannon for a siege in 1380, as did Alfonso XI about the same time against the Moors in Spain. Poudre à canon is recorded in 1338. 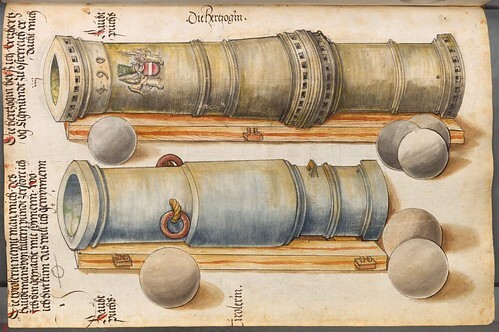 The Osmanli Turks used large cannon at the final siege of Constantinople in 1453, by which date the innovation was widely known in the West. 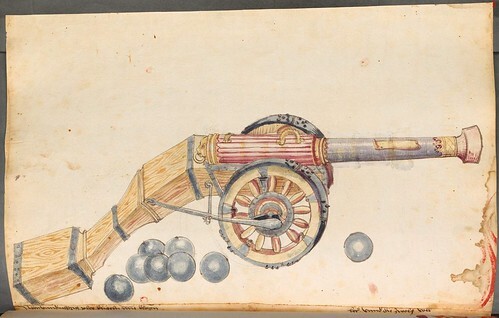 The bombard of 3 ft calibre throwing a 600lb stone at Constantinople seems very large for the time, but apparently such large guns actually existed. The last battle of the Hundred Year's War, at Castillon in Gascony in 1453, where John Talbot, Earl of Shrewsbury, died, was decided by 300 cannon commanded by Jean Bureau. This was the first battle in which cannon were the deciding factor." 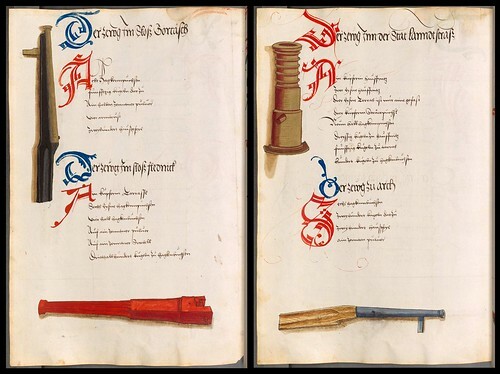 The splendid illustrations above are from a 500+ page paper and parchment manuscript produced between 1495 and 1515. 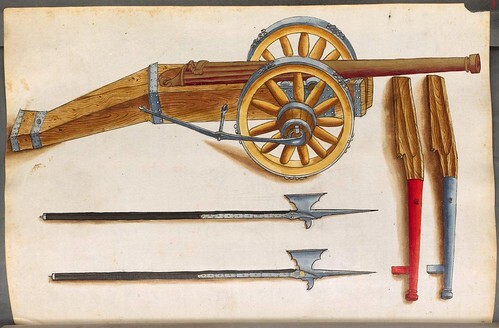 It details the arsenal and artillery innovations of the Habsburg monarch, Kaiser Maximilian I, who was something of an enthusiastic scholar and patron to a wide range of intellectual as well as military pursuits. 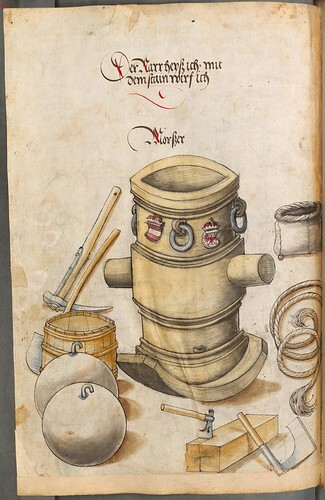 He is credited with the development of the portable cannon and the establishment of the respected mercenary pikemen regiments - seen in a few images above - known as Landsknechts. If I've understood correctly, the manuscript was produced by Bartholomaeus Freysleben in the Regensburg district of Bavaria. The vast majority of this (unfinished) work displays cannon illustrations -- the sampling above is skewed towards showing the variety of images available rather than being a representative group, if you follow -- and many of the individual weapon types appear to be repeated with only minor background or cosmetic changes. 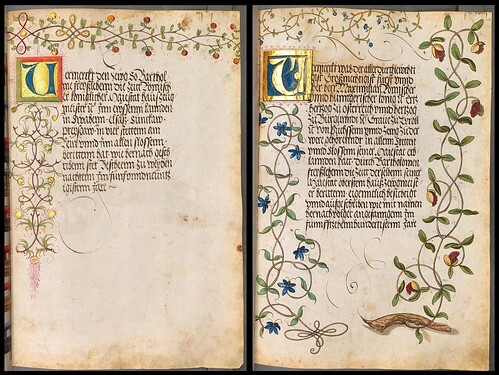 Towards the back of the manuscript there is more in the way of decorative initials, elaborate marginal motifs and rare instances of gold leaf illumination. 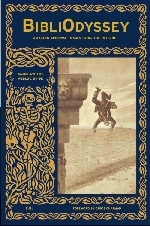 'Zeugbuch Kaiser Maximilians I. - BSB Cod.icon. 222' (the Book of Things or the Book of Stuff) - Table of Contents - is online at Münchener Digitalisierungszentrum. 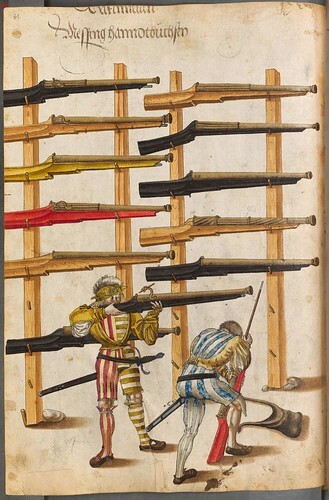 'Handgonnes and Matchlocks - A Preliminary Essay in the History of Firearms to 1500' is a well illustrated and interesting page with an extensive link list. 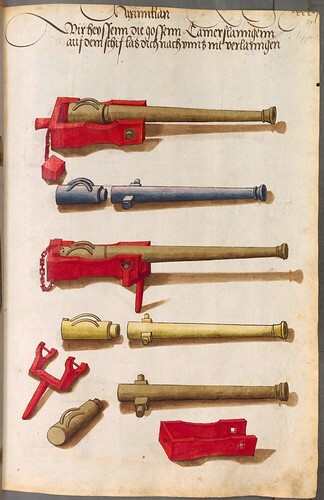 Gunpowder Weapons of the Late Fifteenth Century is another very useful page with timeline and crude graphics and practical explanations of the workings of the various types of proto-artillery. 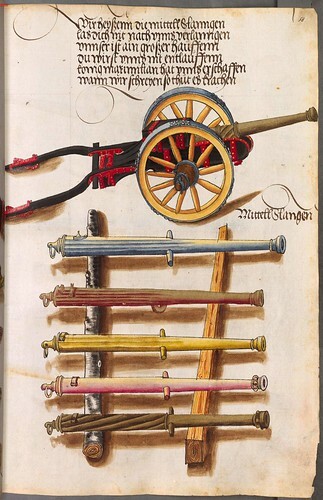 Wikipedia articles worth a look: Cannon in the Middle Ages; History of Gunpowder; Cannon; Fire lance; Bombard; Landsknecht. 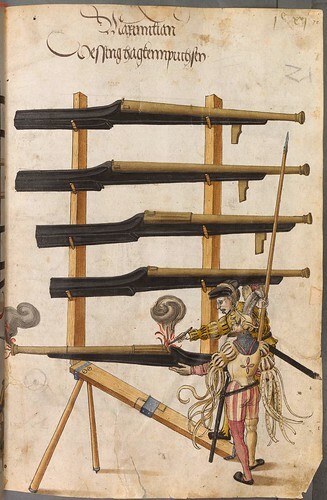 Gun and Gunpowder at Silk Road. 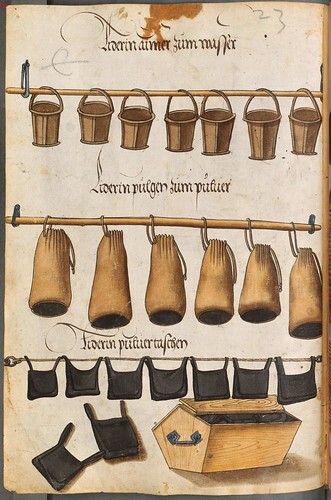 I quite like the brief synopses (referenced) at New York University's The Medieval Technology Pages. In passing: Remember the Knights of Malta? 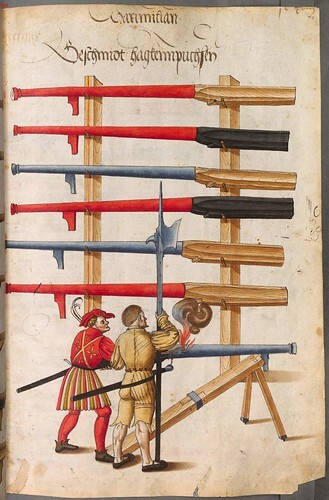 See: 'History's Bloodiest Siege used Human Heads as Cannonballs' in reference to the 1565 Siege of Malta. Equally tangential: Cannon Mania deserves a guernsey here. It's an old site but has a lot of interesting material (and lots of photographs) within. Also: Human Cannonball. Just in time for Fodder's Day! BTW, once again, I am very impressed by the quality of the calligraphy and illustrations here. fantastic , your blog ! Next time I'm in the market for a cannon, I'll know where to go!